By Scott Gilfoid: Deontay Wilder’s manager Shelly Finkel says they have no problems fighting Anthony Joshua in the UK. That’s not a show stopper in putting the fight together. Wilder (40-0, 39 KOs) is willing to fight Joshua on his home turf if that’s the only way it can get made. Currently, Finkel is working with Joshua’s promoter Eddie Hearn of Matchroom Sport to get the fight done. If anyone can get the deal done, it’s Finkel. He’s been doing this for a long time, and he’s one of the best in boxing at putting fights together. If Joshua-Wilder doesn’t get made, it won’t be for lack of trying on Finkel’s part. If the Wilder-Joshua fight gets made, it could be televised on Hearn’s new DAZN streaming network in the U.S. This is a 2-year, $1 billion deal. Hearn might be able to get a few subscribers to his network if he places the Joshua vs. Wilder fight on DAZN. The negotiations have been a long dreary war that just never stops. For a lot of boxing fans, they’re tired of hearing Hearn saying that Joshua is the A-side, and how Wilder doesn’t deserve this or that, and how he doesn’t bring in the same amount of ratings and money. Hearn reminds me of someone that works at a fruit stand arguing with customers trying to get the best deal. It’ll be so good when this is over. 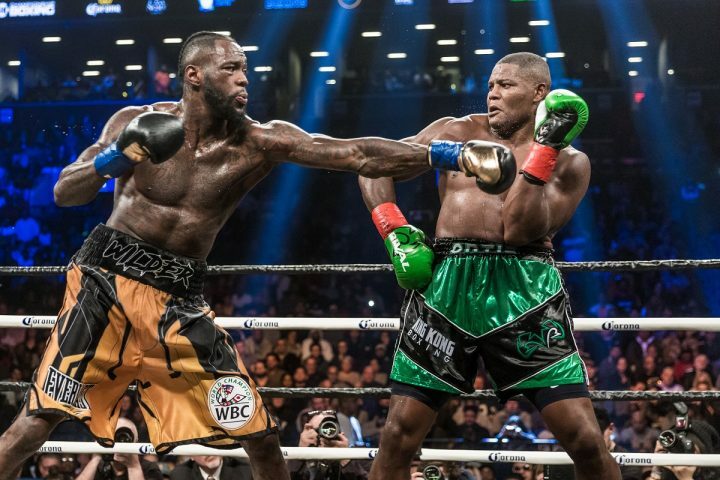 Wilder’s management has already offered Joshua a $50 million guarantee for a fight with 50 percent of the revenue going to Deontay Wilder. Team Wilder wanted the fight to take place in the U.S, but the offer was rejected by Joshua, who doesn’t want to fight in the States. He feels more comfortable fighting in the UK in front of his boxing fans. Wilder’s management’s offer is well and above the $12.5 million flat fee offer made by Hearn to Wilder. If Wilder had agreed to the flat fee, he wouldn’t have been able to share in the PPV profits. He would just get the $12.5 million and Joshua all the rest for a fight that is expected to make over $100 million. So in other words, Hearn gave Wilder a 90-10 purse split offer. The difference in the two team’s offers shows what Wilder is up against in trying to make a deal with Joshua and is management. Hearn believes the offer he made to Wilder was a fair one. 90-10 offer isn’t even the type of split that a mandatory contender would receive. A mandatory rate at 75-25 split. Hearn was treating Wilder like a challenger in one of Joshua’s voluntary defenses, who would be lucky to get a 90-10 split. “If [fighting in the United Kingdom] is a condition for us to get the fight, that will not be an impediment on our side,” Finkel said to ESPN.com. ”There are still some roads to cross but hopefully it will happen and we’ll see the fight this year. If we’re going to make the fight, the place where it will take place isn’t going to be the problem. We have no problem going to the U.K. It never was a problem. Deontay has never had a problem with that,” Finkel said. Well, at least Wilder came into the negotiations with Joshua and Hearn knowing what he’d be up against in trying to deal with them. What could be a problem in getting the fight over the finish line is if Joshua asks for much more than the $50 million. If Joshua asks for $80 million or $90 million, then we’re right back where we started from with Hearn’s atrociously bad $12.5 million flat fee offer to Wilder. Joshua once said that he wants to be the first $1 billion fighter in boxing. If he gets a huge 90-10 split for his mega-fights, then I could see him someday realizing his dream of making a billion. It’s not going to work for this fight though. Wilder wants to enjoy the money the fight against Joshua brings in, and he can’t do that if all the money is going to AJ. Joshua and Hearn need to make a decision soon, because they’ve got Povetkin waiting and the World Boxing Association. If Joshua wants to hold onto his WBA title, he’s going to have to either fight Povetkin or face Wilder in a unification. Either way, the WBA is going to want Joshua and Hearn to decide whether they’re going to fight Povetkin next or not. The Wilder vs. Joshua fight, if it happens in 2018, will take place in the last quarter of the year between September and December. There’s nothing wrong with that as long as the fight doesn’t take place in September. Staging it in that month would potentially conflict with the Saul Canelo Alvarez vs. Gennady Golovkin fight, which figures to attract much more interest than the Joshua-Wilder fight. There will be a lot of interest in that fight, but not the kind of fan interest Canelo vs. GGG will generate. The problem is Joshua is still a complete unknown with the casual boxing fans in America. If you ask the average casual fans who Joshua is, they wouldn’t have a clue, because his fights haven’t been televised for very long in the U.S, and they’ve been shown at odd hours on Showtime. For Joshua to have won over the fans in the States, he would need to have his fight televised during prime time, and most importantly, he would need to fight in the U.S. Since Joshua is unwilling to fight in America, he’s failed to get much attention at all by the boxing fans that only follow the main U.S stars. The fighters that become popular in the U.S are the ones that are willing to fight in the country and fight frequently like Gennady Golovkin. You can argue that Hearn has been trying to turn Joshua into a star in the U.S on the cheap by having him fight in the UK, and then signing with Showtime to have his fights piped into the country. I don’t think that works in building a star. As such, Joshua vs. Wilder likely won’t sell many PPV buys when the time comes for the fight to take place if it ever does. If Joshua takes the fight with Povetkin first, he might be sorry he did so if the former WBA champion is able to connect with some of his hard power shots like he did in his last fight against David Price. Povetkin made a mess of Price’s face, opening cuts that required 41 stitches to close. Povetkin is getting older, but he still punches hard enough to do a job on anyone that he puts hands on. There is some risk involved for Joshua in taking the fight with Povetkin. Of course, if Joshua faces Povetkin with the same referee that worked his last fight against Joseph Parker in charge of the show, then the Russian fighter won’t have a chance to land anything because he’ll be too busy being separated by the referee. Hopefully, that won’t be the case because Joshua has got to be able to stand on his own feet without a referee getting in the way of his opponents trying to land shots. “I’m hopeful that they will get back to me this week and that something can be done to make the fight in the fall. I’m optimistic,” Finkel said about his meeting with Barry Hearn.